In a land where central vacuum technology is usually rather stagnant, there has been some new and exciting things coming to the market. 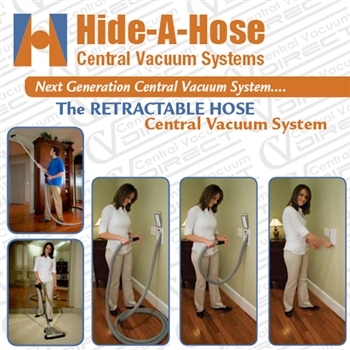 The hide a hose system by HP products is one of the newest advancements in central vacuum technology to enter the household and start to go main stream. For the longest time homeowners have loved there built-in vacuum system, but have lacked that love for the hose which must be lugged around from floor to floor and then thrown in the closet for storage. Although these hoses are lightweight and don’t put much strain on the person using them, they have just become a pain to deal with when you want to clean your home. HP products specifically addressed this concern when they started to market the hide a hose retractable hose system for central vacs. This new system eliminates the need to carry your hoses from floor to floor, and offers a homeowner on the edge about owning a system a fresh perspective about the ease of use and pros of owning one. So how does this whole system work anyways? Instead of having an external central vacuum hose that you would plug into each and every valve, the hide a hose simplifies it and puts up to a 50 ft. hose internally in each pipe. This 50 ft. reach eliminates the need for extra valves in the home. When you want to use the hide a hose system you simply pull your hose out to the desired length then turn on your central vacuum. Since the hose is contained within the piping of the system, there is no need to pull out more hose than you need and you can clean more efficiently. Getting your retractable hose back into the piping in the walls is the part which a lot of homeowners like because of its ease of use and good overall engineering. After you are done cleaning all you have to do is put your hand over the hose where you have suction, this in turn will create a void space of air within the hose and pipe itself. The hose is designed so that it will fill this void and automatically retract back into your pipe and out of the way. There are several good things to say about the hide a hose system, but there are also a few cons that need to be addressed in order to properly review this product. The first thing homeowners will notice is that none of the hose are high voltage, nor can they a high voltage hose be integrated into it. With this feature gone you basically wave goodbye to cleaning with an electric power head. Your only other option would be to use a suction powered head such as the vacuflo turbocat. Overall these suction powered heads aren’t going to clean as well as the electric ones, which may leave some people in doubt of whether or not the pros weigh out the cons. Another reason why these systems may not work as well is the dust which is going to reside in the pipe after it is turned off. This dust may end up on the hose, and when you pull it out of the piping it could possibly be spread throughout the home. Overall the hide a hose is a good product and is perfect for those die hard homeowners who are looking to rid themselves of the horrors of carrying around a 30 ft. hose, but it may need a little tweaking in order to pair it with a proper electric power head. As Always thanks for reading & happy cleaning!